It's really hard to get a decent photo of this, but it's another gift that's going in the Christmas box. .. It's a crocheted shawl - in the very lovely (and sparkly!) yarn called 'Shawl In A Ball' from Lion Brand. Pretty easy to make - it's just rows of double crochet, chain one. Took about 2 balls of the yarn because I wanted to make it a little wider than perhaps the norm. - There are lots of free quilt patterns available HERE!! - For those that have a four-legged family member of the feline sort, perhaps they would like one of THESE for Christmas (you'll have to scroll down to find the pattern). Or maybe your kitty might like THIS! - THIS is a very pretty fabric Christmas tree. And HERE is a crocheted version. - You might like to keep your eye on THIS site where they are starting a '30(ish) Days of Christmas Knitting' series. I like the first pattern so will definitely watch to see what else comes up. - THIS is a cute little fellow to knit for Christmas - he'd look really cute on a tree. - For those of us who enjoy knitting socks but have a phobia about the dreaded Kitchener Stitch - have a look at the tutorial HERE for an alternate method. - If you have young ones on your Christmas list, perhaps they'd love a new fleece bathrobe to wear on Christmas morning? You can find a free pattern HERE. - For Lego lovers in the world, how about creating a REALLY fun advent calendar/activity for your child? (or an adult, like me, that would like to play too!). Go HERE to read all about it and see some fantastic ideas of what to include! Today your quote is from Winston Churchill..."We make a living by what we get, but we make a life by what we give"
Judy won my postcard giveaway and was kind enough to share her favourite Christmas recipe with all of us. She says it was her Mom's recipe and 'is the best'. Enjoy! After above has simmered, add ¾ cup butter/margarine (I use margarine) & a jigger of dark rum or whiskey to the mixture. Dark rum is best! Mix everything together & bake. I use a tube pan, lined with wax paper. It’s important to bake at 275 & no higher. Test for baked cake by inserting a wooden skewer into cake – if a bit sticky add another 5 minutes to the time. Put a small pan/bowl of water in the oven when baking cake – adds moisture. Let rest in pan no longer than 5 minutes, turn out on cooler. Cool completely. Cakes freezes well. Wrap in plastic wrap, then in foil wrap. Butter tarts - lots of them! Ready to go in tins for Christmas giving. Today your quote is from another anonymous source..."Some things are just wonderful, like friendship and chocolate cake"
Just a reminder - don't forget to enter my giveaway (see my previous post for further information and to enter)!!! So far not too many people have entered so the chances are good that you might win. I don't often do any sort of company review here, but after having received some exemplary assistance from one such company I thought it would be nice to share so those of us who live in Canada are aware that there are good ones out there. I recently placed an order for some yarn from 'Yarn Canada' and was impressed with their prompt service. I started knitting the sweater I had planned and quickly realized that it was going to be too small and I would need to frog it and make a larger size. Of course that meant that I would run out of yarn before I ran out of pattern. I emailed the company and asked if there was ANY chance they could check their supply to see if they would happen to have any left of the same dye lot. I didn't hold out a lot of hope, but a lovely person named 'Gina' promptly emailed me and said she would see what they could do. A further email from her (within 24 hrs) let me know that indeed they did have that dye lot and told me what to do in order to be sure it was the one they shipped. These days good customer service isn't always forthcoming and so I thought it was fitting to give them a shout out here and let folks know that they're a great company! - HERE's another really cute project tutorial that might make nice gifts. - I'm not a tatter, but THIS might be something of interest to those of you who do. - Kathy Shaw has announced a Quiltathon for her 'Celtic Candy Stripe' pattern and you can find more info HERE. 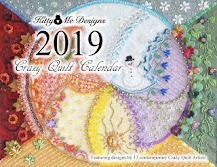 - Pam Kellogg now has greeting cards and journals featuring her crazy quilts available and you can find out more by going HERE. - Many of us have old books on our shelves that we really don't know what to do with. Well, have a look at what Suzy has created HERE!!! While you're there, take a little time and explore her blog (and prepare to be blown away!!). - For those of you who have Barbies in your family, perhaps there might be some patterns HERE that you might like to create. - For the sewers out there, how about creating THIS for a loved one? - HERE is a really nice (and different) Christmas table runner pattern. I really like this one and might just make one if I can find the fabrics to do so. - Hee hee - I dare you to make one of THESE and post pictures afterwards! I'd like to wish a very happy Thanksgiving to my friends in the US - they are celebrating today whereas here in Canada ours was in October. And finally, your quote of the day comes from Zig Ziglar...."The greatest source of happiness is the ability to be grateful at all times"
First of all, I would like to remind everyone that the 'Swap Your Mini's - Artist Trading Cards CQ Style' swap is still open! 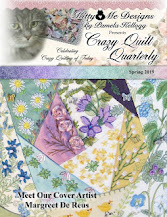 The staff of 'Crazy Quilt Quarterly' is hoping for lots of people to take part so it will be fun for all. It's a one-for-one swap of Artist Trading Cards (measuring 2 1/2 x 3 1/2 inches) created in the crazy quilt style. Deadline is Jan. 31. More information can be found HERE in Pam Kellogg's post or HERE in my original post. You may contact either Pam or myself for further info. Please join in the fun! - THESE would make amazing gifts (and stash bust too!). - Another of those things that are just too cute not to share HERE. - One of THESE would be SO pretty all lit up for a festive decoration (or any time of the year). - HERE's a really cute crocheted hat pattern for kids. - There's a pretty Christmas placemat tutorial HERE. - There's another printable 2018 calendar HERE (so pretty!). - THIS gives a whole different twist on yarn bombing (and made me laugh too). 1. Leave a comment on this post telling me what your favourite Christmas dessert or treat is. You must be a follower of my blog to enter and only one entry per person please. I will leave the giveaway open until Friday at midnight. 2. Be prepared, should you win, to share the recipe for your favourite so we can all give it a try! (once I finish it, that is!). Today your quote is... "In my life, I've lived, I've loved, I've lost, I've missed, I've hurt, I've trusted, I've made mistakes, but most of all, I've learned"
How about a recipe? I haven't shared one for awhile and we found this one really tasty, and even better? It's made in the slow cooker so it's easy. Win/win!! longer). Combine 2 T. butter (or margarine) and 3 T. flour and drop into stew. Stir and then cover & cook for 15 mins. longer. - HERE is a rather cute cross stitch bee pattern. - Red Heart has a 12 Weeks of Christmas on right now - 12 fun patterns for free and you can access the ones they have published already HERE. - If you have a baby to make gifts for, perhaps one of THESE might be welcome. - If you're looking for a really cute advent calendar idea, how about THIS one? And further in the Christmas decorating theme, how about a fabric village found HERE. - THIS would be a nice gift for either a man or a woman, depending on the fabrics you choose. - If you are trying to sew with larger cones of thread and are having difficulty with them feeding properly through your machine, maybe you'd find THIS hint useful. I know I'm going to try it! - If you are interested in amigurmi patterns, have a look at THIS site. There's tons of free patterns! Today your quote is from an unknown source..."If you like someone, tell them. If you miss someone, tell them. If you love someone, show them. Life is too short to keep your feelings inside"
The first is a set - hat and cowl. the rim rolled up for extra warmth. attached or not, as desired. The hats were both made using the 'Sandoval Hat' pattern from SheMakesHats and the pattern can be found HERE. This is the absolute best hat pattern I have ever found - for both women and men. Very stretchy and fits a multitude of head sizes. The cowl was made using the same hat pattern and just knitted until I thought it was done (or you run out of yarn, whichever comes first!). - Pour yourself a cuppa and head on over HERE and scroll through all the free projects available. There are several pages of them! - I'm certain I would never attempt anything like THIS, but isn't it amazing? - If there's someone in your life who wears a baseball cap year 'round and complains of having cold ears, perhaps one of THESE might be a fun gift. I think THIS one could easily be used in the same way. - THESE would make absolutely lovely package toppers - or ornaments for the tree. Perhaps with the addition of some artificial greenery? - THIS little guy would be cute to make for a little one. - If you happen to have some upholstery samples in your stash, perhaps you'd like to have a look at THIS tutorial. You could also use denim or any heavier weight fabric. - I absolutely love THIS idea for Christmas decorating, especially if you were to use an old set of those encyclopedia's that no body has any use for! Or the Reader's Digest Condensed books that we all seem to have an abundance of! - If someone you know loves Lego (not that any of US would ever admit to it....ahem), have a look HERE to see some absolutely amazing creations. Today your quote is from an unknown source..."Don't change so people will like you. Be yourself and the right people will love the real you"
Today is reveal day for the 11th Tea Cup and Mug Exchange ever so capably held by Stephanie of 'The Enchanting Rose'. Welcome to all who are visiting from that! Back in September she opened registrations to sign up to swap either a mug or a cup and saucer and she organized over two hundred participants and matched us all up with partners. Excitement was in the air as everyone chose special gifts for their partners and then the anticipation as we waited for something to arrive in our mailboxes. There was a lovely mug with a matching spoon, accompanied by a lovely wooden coaster/holder - some tea (including some special Canada 150th birthday tea) and some hot chocolate. A beautiful floral apron in my favourite colour; a super pretty rose-themed journal book; and a 'Time For Tea' coloring book filled with not only pictures to color but also great ideas for embroidery patterns. There was a beautiful handmade card and a lovely letter too....along with a little Canadian flag pin. I was absolutely in love with everything and have taste-tested all the tea already. The hot chocolate is being saved for the first snow - because I need a little treat to console myself over the beginning of winter...hee hee. Judith, you made my day, my month, and my whole entire year so special! Thank you soooooo much!!! Her favourite colours are brown and green and she has kitties, so I simply HAD to give her the mug with the cat on it! She also likes to crochet and of course likes tea, so I included a doily, a coaster, and the rose candle holder; along with a pincushion and a scissor holder. Of course there was tea in the parcel too. I had great fun choosing and making special things for her! Because today is the big reveal day, please visit Stephanie HERE and see some of the lovely things that were exchanged...and....if you go to the bottom of her post there will be lots of links to visit many of the bloggers that took part. I thank Stephanie for all her work arranging the swap and for matching us up so well. I know it has to be a huge amount of time she invests into this amazing swap - she is obviously a very special person! - There's a wonderful tutorial from Ann Wood HERE to make one of her paper boat designs. - Karen Ruane (embroiderer extraordinaire!) has a new online class about to begin and you can find more information HERE (class began Oct. 30 but you can register any time). She is also doing another workshop in London (England) and you can read about that in her post found HERE (how I wish I could go!!). - THIS is another one of those things that just makes you say 'awwwww' (scroll down to see the picture with the real baby!). Today your quote is from Job Lazarus Okello...."This is your life, and you've got to fight for it. Fight for what's right. Fight for what you believe in. Fight for what's important to you - what adds value to your life, what makes you a better person. Fight for the people you love, and never forget to tell them how much they mean to you. Realize that right now you're lucky because you still have a chance. So stop for a moment and think. Whatever you still need to do, start doing it today; don't procrastinate. There are only so many tomorrows. Every moment that passes you will never get back. Therefore make the best use of it." Okay, children.....file in and take your seats. No talking in the back!! Today we will be having a lesson in how not to. Please note that today's lesson is as a result of a life lesson that needs to be learned by all who aspire to stitch....all those who believe that the use of an iron is advantageous to same. We begin with a stitcher - holed up in her sewing room, by herself, with no one to take her by the hand and guide her in the facts of life. Said stitcher is facing time constraints with the creation of items seemingly necessary for a 'certain' date that is just around the corner (and yes, children, sometimes Santa DOES need a helping hand). Said stitcher has plans. 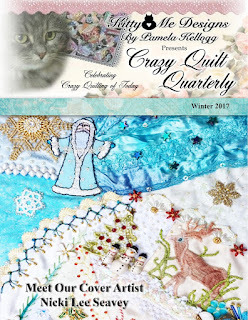 Plans to create a number of crazy quilted postcards that require some sort of little Christmas-y picture on same. Said stitcher decided that a much easier (and thus faster) method to print said pictures was to simply use paper. Said stitcher, having screwed the dimmest of her light bulbs into her brain, did that very thing and then coated same with Mod Podge on front and back to (at least in her brain) render the paper tear-proof. So far, so good. Stitcher then carefully, and lightly, glued coated pictures onto fabric. Twelve of them. Now children - can you guess what happened next? First we will have our recess, peruse some mumblings, and then I will tell you the rest of the story. Before the mumblings of the day begin, I have a question for any of you who use invisible thread in your work. I'm looking for recommendations as to which brand is the best and would welcome input. Thank you in advance! - THIS little fellow certainly fits under the 'awwwww' category! - There are two great ideas HERE for decorating your door (and your refrigerator!) for Christmas. And THIS decorating idea made me smile - alas there are no banisters here for me to try it out. - Have a look at the textile art of THIS artist (there are two galleries you can click on to see her amazing work). - How about checking out the many links HERE to make your own Christmas-themed table runners and placemats. There are also links there to lists of stockings and other Christmas things. Okay boys and girls, take your seats and we will continue the story. Did any of you guess what happened next? Stitcher began to stitch the fabrics around the lovely Podged pictures and, as is usual with such an endeavour, needed to press the seams in place so they were nice and crisp. What to her wondering eyes did appear but something closely akin to slime. Why was that you ask? Well it seems that heat from an iron applied to Mod Podge is a recipe for disaster and the Mod Podge simply melts and adheres all over the fabric AND the iron. The moral in this story, children, is that a stitcher should learn never to cut corners and be smart enough to rely on the tried and true method of printing onto freezer paper'd fabric. Today the quote is from Stephen Colbert...."Contrary to what people may say, there's no upper limit on stupidity"
The fleece turned into this pillow for our grandson for Christmas. The pattern is HERE if you'd like to make one too! The pattern modifications I made were to use some other fabrics from my stash for the eyes and beak rather than the fleece it called for and I didn't use buttons for the eyes, opting to use fabric instead. I adhered the eyes & nose with some lightweight HeatNBond before stitching them down - otherwise the fleece likes to 'travel' as you stitch. - The 2018 Crazy Quilt Journal Project is open for registration and you can find out more HERE. And THIS link will take you directly to the rules. Registrations are being accepted from now through the end of December. If you would like to complete a larger crazy quilt project this would be an ideal way to keep you on track! - Pam Kellogg is just beginning Band Three of the Never-Ending Sampler series and you can find the first pattern HERE. - If you have a little person who happens to like American Girl dolls (or ones of that size) perhaps you might like to check out THIS link to tons of outfits you can make. - THIS little guy made me smile - wouldn't he look cute on a Christmas tree? - If you have a person who is a fan of Captain America, maybe they might like to find THIS or THIS under their Christmas tree. Another quote from an unknown source...."Every single person on the planet has a story. Don't judge people before you truly know them. The truth might surprise you"